Saint Clement, who was from Ancyra in Galatia, was the son of an unbelieving father, but a believing mother whose name was Sophia. At first he lived as a monk, later he became the bishop of his city. He suffered so many things in confession of the Faith in Christ, that the time of his sufferings and struggles stretched out over a period of twenty-eight years. Finally he and Saint Agathangelus (who was from Rome) were beheaded together during the reign of Diocletian and Maximian, in the year 296. As an honored branch of Christ, Who is the True Vine, all-famed Clement, thou didst win thy many contests for the Faith, crying with them that had shared thy pains: Christ is the Martyrs' exceedingly radiant joy. 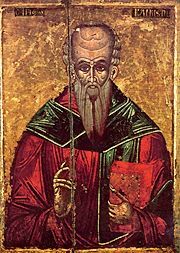 Share the feast of The Holy Hieromartyr Clement, Bishop of Ancyra with an icon greeting ecard.